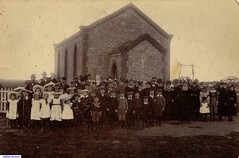 The foundation stone of the Shannon Methodist Chapel was blessed by Mr. Joshua Marshman of Mallala on 8th October 1872. The Shannon Methodist Chapel was officially opened on 17th July 1873 on land donated by Messrs Wright Bros. 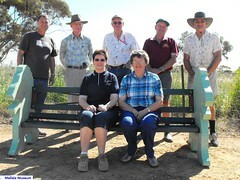 The original trustees were Messrs G.N. Johnson, N.J.W. Lindsay, J. David, S. Davis, J.P. Sutton, R. Cooper and C. Carslake. Mr. Hartley was elected curator of the cemetery ajacent to the church. In July 1923 the Jubille of the Shannon Methodist Church was held over several days. and on Sunday July 23rd two services were held with Rev. A.W. Wellington as Preacher. Due to declining numbers the church was closed in 1957 when Rev. R. C. Dalton was the circuit minister. 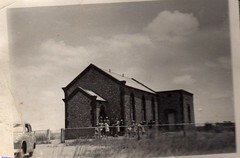 The church building was demolished in 1966 and at that time the District Council of Mallala took over the management of the Shannon Cemetery. 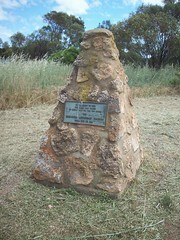 A cairn was built on the site of the Shannon Methodist Church and on April 17th 1977 the plaque was unveiled by Mr. Frank Johnson. Rev. T.C.O. Patrick was invited back for the Memorial Dedication Service. 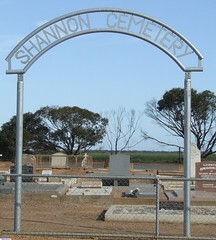 The sign "SHANNON CEMETERY" was built by the firm Basset Welding & Fabrication, Lewiston and erected in 2005. 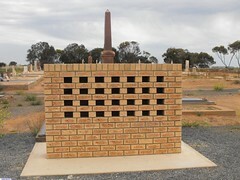 On April 11th 2010 a service was held at the Shannon Cemetery to dedicate the newly erected columbarium. During the service Mrs Gwen Secomb was the master of ceremonies and Rev Grant Jewell officiated. Do you remember Shannon Cemetery ? Then Join up and add your memory here.